This set contains 60 superbly detailed figures representing Rome's Italian allied legions in a mix of armour styles, including muscled cuirasses, Triple disc armour and pectoral plates. Suitable for The wars with Pyrrhos and the Punic wars against Carthage, the first and second Macedonian wars and the conquest of Greece and the wars against the Successors. They also can fight Celts, Spanish and Numidians. 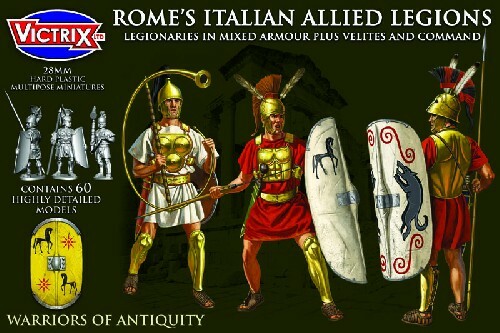 The set contains 36 legionary figures which can be armed with pilums, swords and long spears and come with an assortment of 12 legionary helmets which include Montefortino, Attic and Corinthian styles with assortments of feathers and separate crests to individualise your Italian allies even more. Not only do you get the legionaries you get 18 light infantry in the set which can be made up as Velites or the less well armed earlier Italian light skirmishers (The choice is yours) They can also be used for a massive variety of other troop types if you mix in shields and heads from our Greek sets and you can also make un-armoured Oscan type warriors. Each set has 3 command frames giving you 3 Centurions and 3 standard bearers. There are musician arms which you can use to convert a legionary to a musician.